In between the rains our Parks Maintenance crews have been renovating the City’s sporting fields. Pickleweed Park has been aerated, fertilized, over seeded, and top-dressed. The main reason for aerating is to alleviate soil compaction but the perforations also allow air, water and nutrients to penetrate the grass roots. This helps the roots grow deeply and produce a stronger, more vigorous lawn. 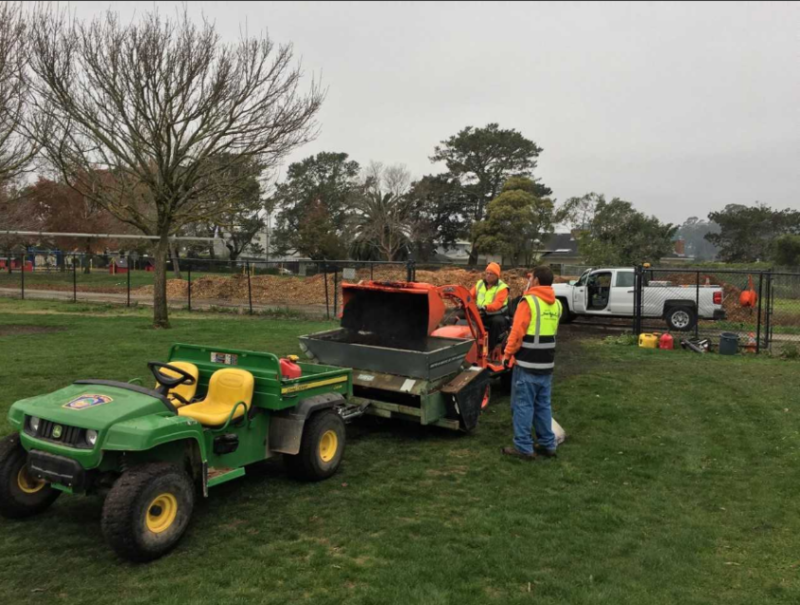 Next, the crew then began work on the Albert Park ballfield, home to San Rafael’s Pacifics Baseball team and countless community sporting events. They removed the damaged turf and are prepping the area for new sod. Sod is used to establish a lawn quickly especially in areas where seed has the potential to simply blow away. On hillsides and new construction sites, sod can help prevent erosion and it can even be used to improve cooling. Fun Fact: In Scandinavia, sod is often used as a roofing material.